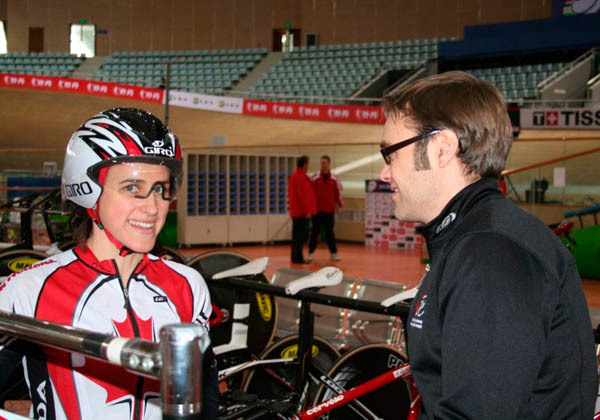 Over the past year the Canadian Track program has been focused on creating a team of riders and support staff, to move forward in their quest for 2012 and 2016 Olympic success; as well as building on the two World Championship medals that were won last March by Zach Bell and Tara Whitten. Training camps, with strong training groups, have been organized by the Canadian Cycling Association almost once a month since September and the athletes are benefitting from the new group focus. Canada sent small teams to the first two World Cups and then a full team to Cali in December where every rider came away with a personal best, three new Canadian records were broken, and the team came home with 1 gold and 2 silver medals. The focus of the athletes has changed from trying to make the team to wanting to podium. Ten riders are now in China for the last World Cup where they are getting acquainted with the track and the time change, the air quality and the food. Coach Richard Wooles is expecting the team to come away with medals at this event too; however, he sees this competition as a progression in the development of the team. There is a full staff support team for this event, like there was at the third World Cup, which allows the coaches to coach and look after the physical, mental, and emotional state of the athletes; to help best prepare them for racing. The other staff members are looking after the mechanics, the managing, and all the small errands that need to get done and are time consuming and distracting for the coaches and athletes. Allan Leparskas will make his World Cup debut in the Kilo on Day 2.